At the time of writing this (may 2017) Avastar 2.0 has still not had an officially release. It made its way to Release Candidate 7 (RC7) before halting with no clues to its eventual release. My own experience with the plugin has lead me to a bit of frustration since Avatars workflow changed dramatically when it entered RC stage. A feature i had been relying on was changed to what is supposed to be a better version, namely ‘Convert to Bind Pose’ which should allow me to create my avatar in any pose and import to Second Life with no issues. 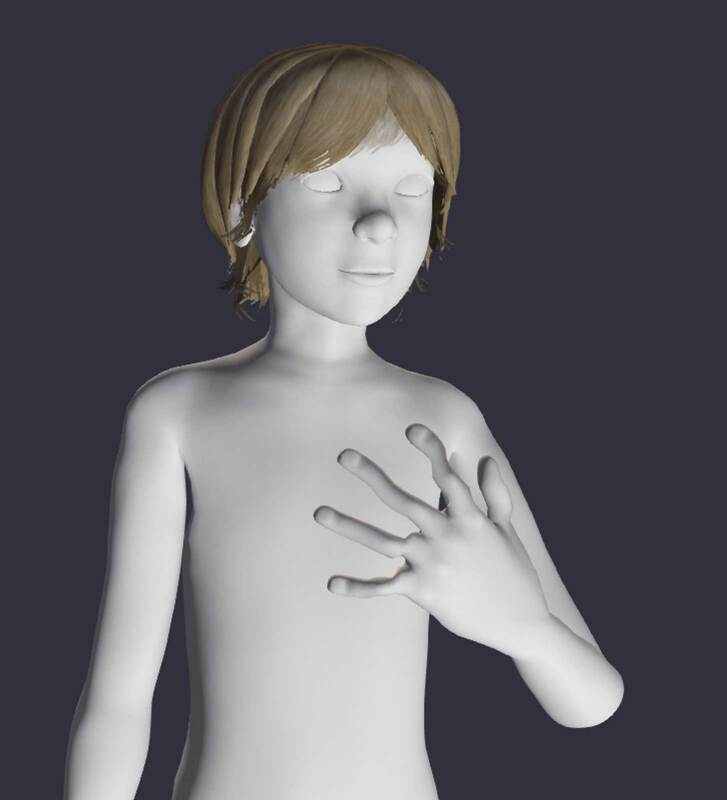 Originally this feature would convert your mesh avatar from what ever pose you created to the Second Life T-Pose. For me this allowed for better shoulders and is easier to work areas such as the legs. After you have finished your work you’d simply click a button to ‘alter to rest pose’ which would be the default SL T-Pose and import to SL. In the new version i think the ‘convert to bind pose’ does away with the need to set the avatar to T-Pose before importing to Second Life. For me this does not work though. Instead of converting my pose, it completely rejigs the pose and the bones making a mess. Apparently it has something to do with my avatar not being a specific shape and size of woman… Perhaps the big delay between RC7 and any more news is because this is an issue being worked on. In any case i wait patiently. While i continue to wait for Avastar 2.0 to be released i have had to create a work around to continue testing my avatar, and incase Avatar is released and i still have the same issues with it. Some of my tests have been with how to make my new bento avatar compatible with current classic mesh clothes and SMB clothing (Super Mesh Bros). Some of the tests showed that i may need to be more considerate of the position of the mesh body on the rig to reduce poke through on critical areas that can not be masked out such as the collar, and the sleeves. An issue thats come up with fitted mesh and child avatars was EXTREME FAT. I rigged my bento avatar to the customisation sliders at 50/50 in most cases. This was so that users could make my avatar skinnier or fatter. 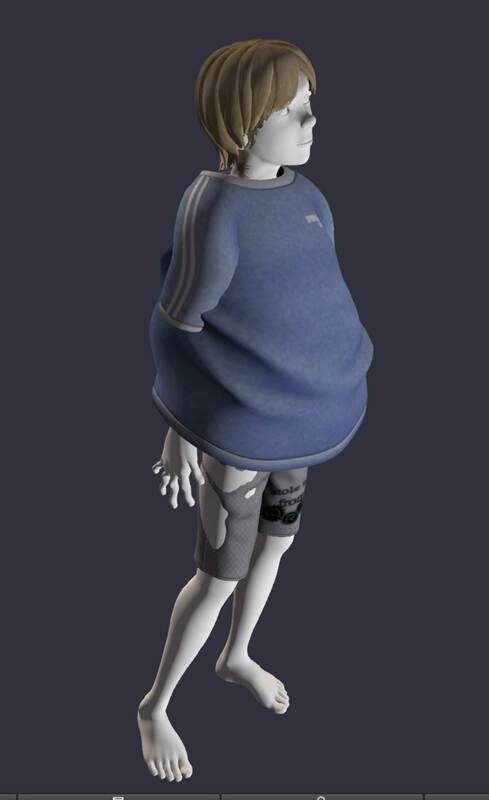 But kid avatars in Second life are almost all created with the sliders down to zero as well as the fitted mesh clothes they wear. 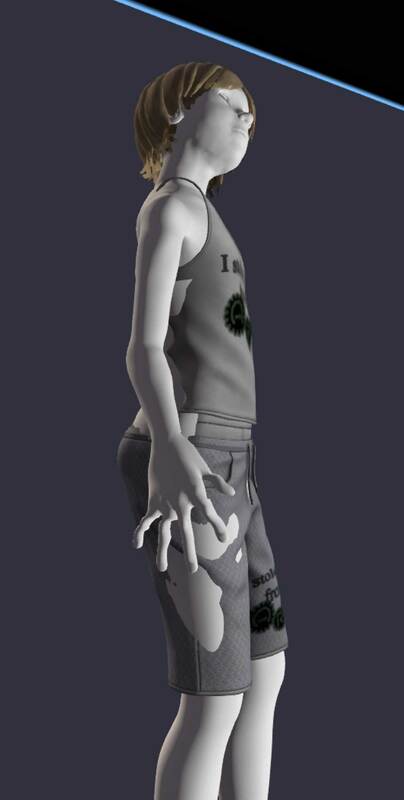 So when my 50/50 Bento Kid avatar wore a fitted mesh shirt… well you can see below what happened. So what do i do in this instance? 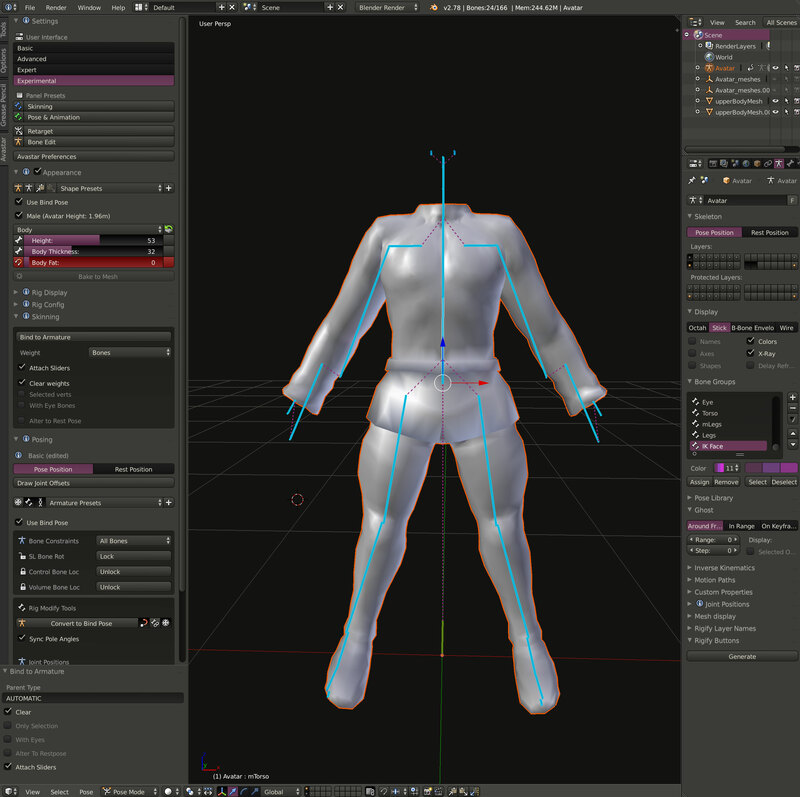 i could allow users more customisation of their avatars size and shape, but that would mean incompatibility with clothing made for avatars with sliders set to zero. When it comes to customisation sliders, fitted mesh and kid avatars things are very complicated. I will have to do more tests and see just which sliders i can get away with being 50/50. This also effects my future clothing experiments. 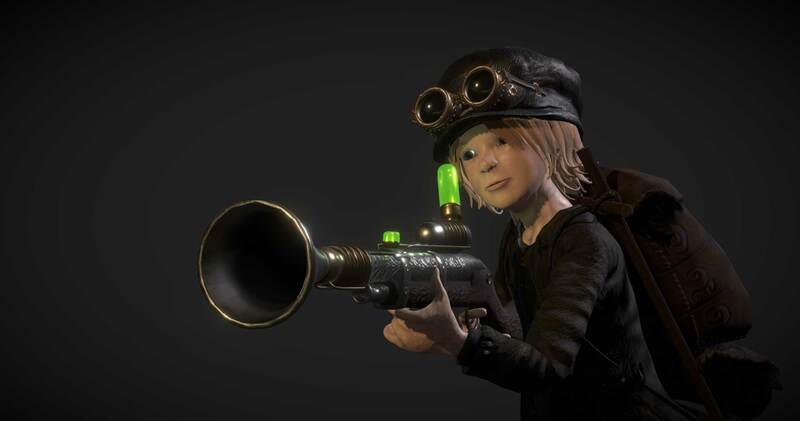 If i make an avatar thats set to 50/50, those clothes on a default kid avatar just won’t fit properly. Another issue is i have wonky fingers. This is because i must have edited the finger bones instead of posing them. Its and easy fix but shows that i have to be more careful. I hope to have my new avatar up and running by the time SL14B starts which will be three years since my current mesh avatar was introduced. Its a balancing act of using the latest features of Bento and keeping things compatible with the old. It’s not easy being a kid avatar. Regardless of how hard it is to import avatars to Second Life, importing to other platforms has never been easier. Below is my new avatar imported to Sketchfab wearing my current Timerascal range of clothing. Wow! The expressions on your avi look pretty cool! That’s also probably how SL would look with PBR O_O. Un-be-lievable!